Last year, in August, my husband and I drove to Stratford, Ontario for the Shakespeare Festival, to see Antony and Cleopatra. On the way, we stayed over in Rochester to break up our trip. Once before we’d been to the city and had been driven past two wonderful cemeteries. We decided that if we ever came back to town, we had to visit. 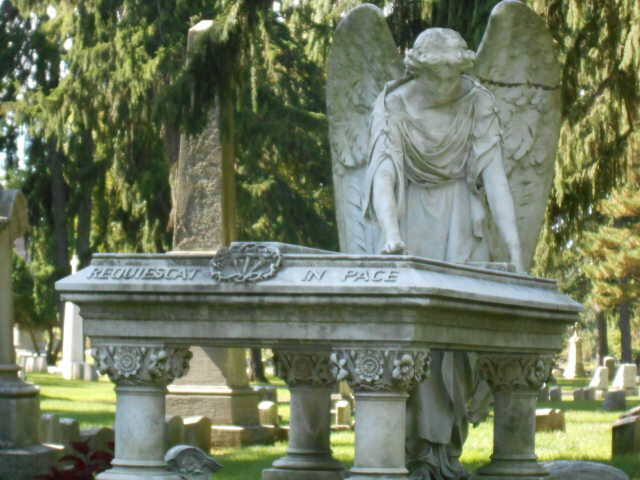 We love the nineteenth-century “Romantic-style” cemeteries, most of them based on Mt. Auburn in Cambridge: sloping grounds, ponds, shady trees, a beautiful parklike setting. 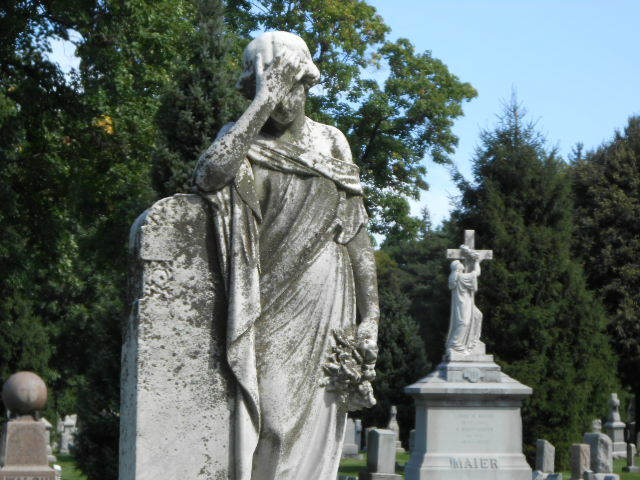 As a matter of fact, when these cemeteries were originally designed, the idea was for the whole family to take a Sunday afternoon and picnic, relaxing in the beautiful scenery, communing with nature, and visiting with lost beloveds. 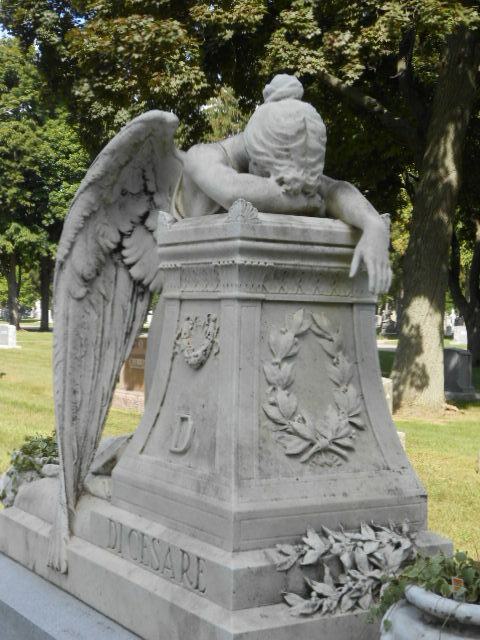 The exquisite, evocative, wistful statuary creates a mood of delicious melancholy –– though Whovians may feel far different emotions when surrounded by (seeming) stone weeping angels. These two cemeteries face each other across a busy road. Yang and I started on the side without the redstone, castle-like gates. I don’t remember the names, but I bet my friend Tim Shaw could tell me! 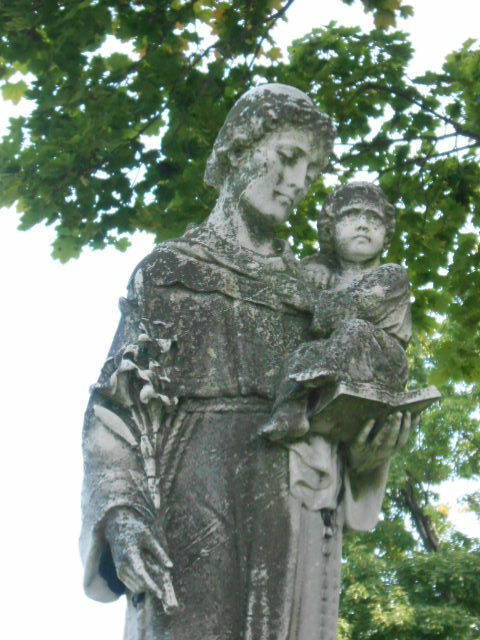 The first cemetery that we visited was Catholic, which is brought home by the beautiful statuary of saints and angels. This large monument celebrated St. Joseph, holding his “step son” Jesus. I love the angels flanking on both sides. It was extremely hard to get a picture without too much shadowing. I always liked St. Joseph. He was a good Dad, and my father’s middle name was Joseph – and he was a wonderful dad as well. Here are two of the St. Anthonys immortalized, also holding baby Jesus. 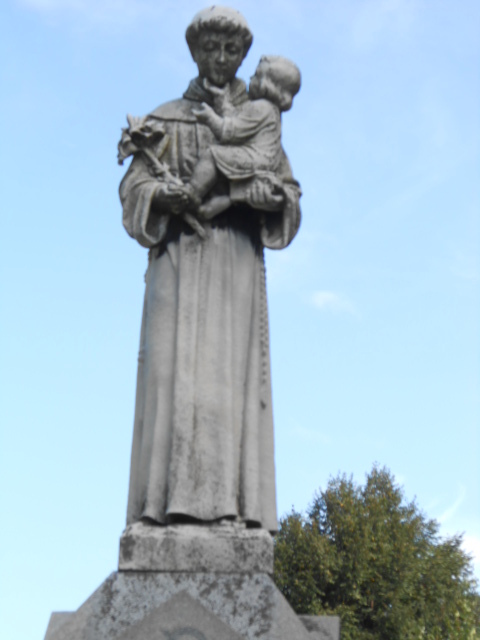 Clearly St. Anthony is a popular patron saint in Rochester. Maybe this is St. Anthony’s Cemetery, or a lot of people were praying to find something they’d lost- he’s the patron saint of finding what’s been lost. Whatever the case, they are so wonderfully sculpted. The faces show such deep and beautiful feeling. the graceful folds of the robes seem ready to shift with the breeze or a movement. And the mossy covering adds a lovely Gothic shading. 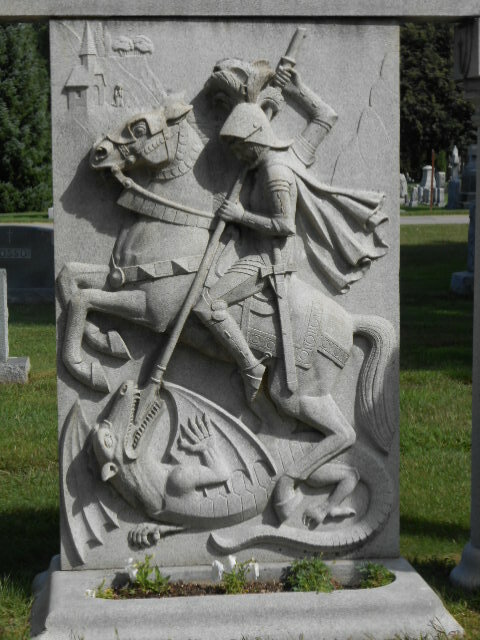 St. George and the Dragon, no less! This guy’s family clearly thought he was a champion of . . . what? Pretty impressive, huh? The monument is actually much wider, with statuary on the sides. Many of these graves had such elaborate stones that had arches and side statuary. 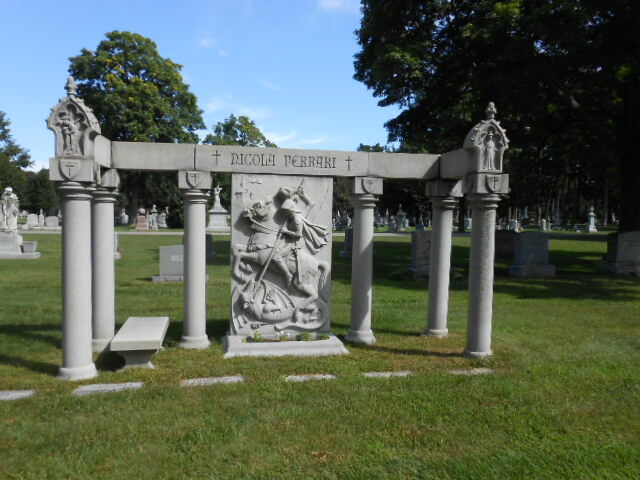 Two other places you see a lot of these kind of elaborate tombs are at Sleepy Hollow in Tarrytown and Woodlawn in the Bronx. Note that this is one one really long monument. 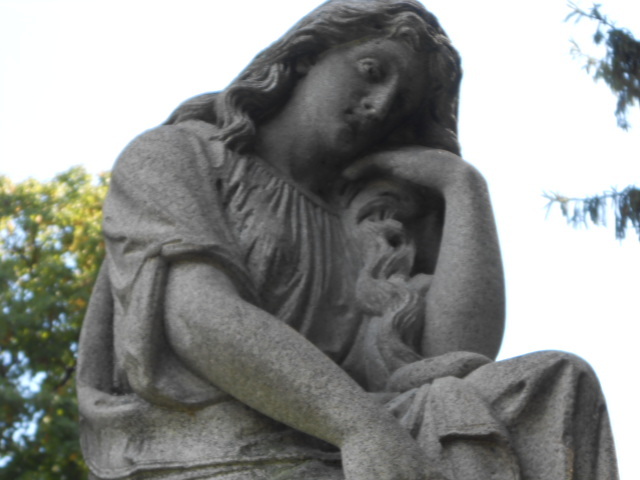 There were also many of the traditional weeping ladies and powerful angels that you find in many Victorian cemeteries. Again, some are still smooth, while others are mossy, but all have a lovely melancholy to them. Look at this child, someone’s little girl. The closeup shot of her face lets us see her as a real person. Look at the sadness in her expression as she holds a basket of flowers as delicate, lovely, and evanescent as her own life. I’m particularly fascinated by this brooding woman, standing tall, but not quite able to look us in the eye. Still, she’s peeking through one uncovered eye. Or maybe she just has a really bad migraine? Anyway, Dr. Who fans would probably think she’s trying to cheat. Across the street and past the redstone gates it was much shadier; there were far more trees. And this was a brutally hot August afternoon. You can tell by how washed out the sky looks in some of the shots how brilliant the sun was that day. As my physicist husband pointed out, the UV was baaad. 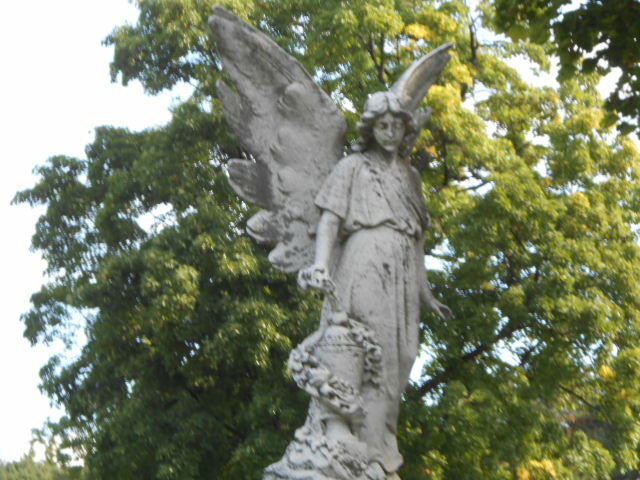 I have to point out some images of my favorite monument, the greiveing angel. This figure was actually a tad unnerving, but beautiful. The grace of the carving made it seem on the verge of movement. And those enormous wings hinted at an unsettling power. So here are two shots. Again, Dr. Who-followers, keep your eyes open! Love the cemetery write up! 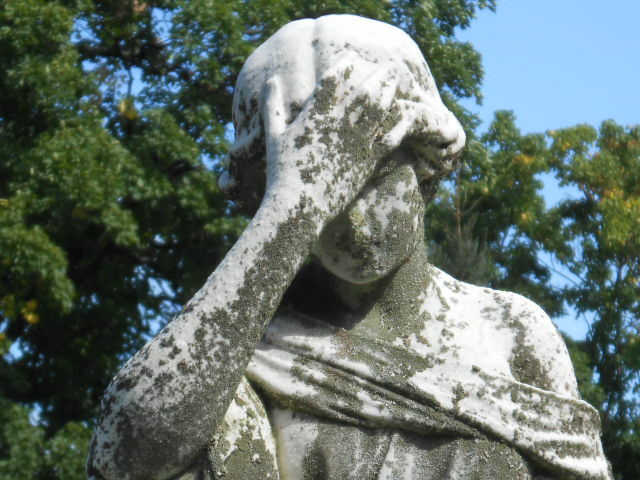 I am a HUGE Taphophile and go to cemeteries weekly! Last week I went to Mt. Auburn but it was so hot I only got through less than a quarter of the cemetery. I had been there before but again only did a small area so it was nice to go back. So many unique and beautiful artwork! 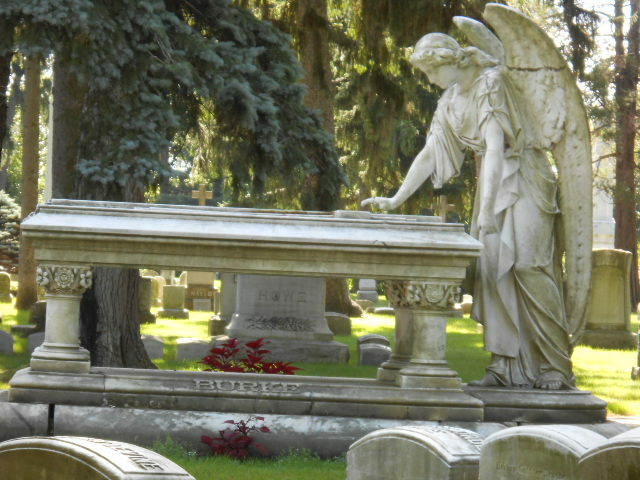 Even here in our own backyard with Hope cemetery and or better yet St Johns or Rural cemetery are amazing! Spider gates(quaker) is also extremely interesting or if you ever have a chance to go up to Barre Vermont there is an amazing cemetery up there with artwork that is just insane! I am so happy that you did this blog because now I have another cemetery to visit 🙂 can’t wait for more information on your book hope its coming out this fall as I could use some great reading if the wonder is anything like last year! Have a great day. 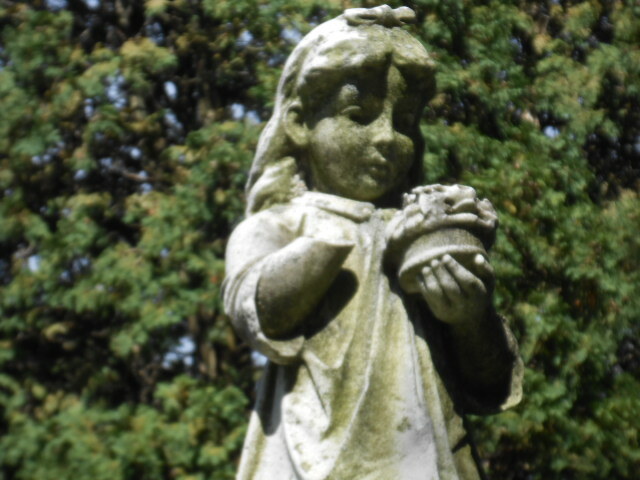 I didn’t know that you loved old cemeteries, too! How could we live across the street all these years and not realize we have so much in common?! I love Hope Cemetery, also. 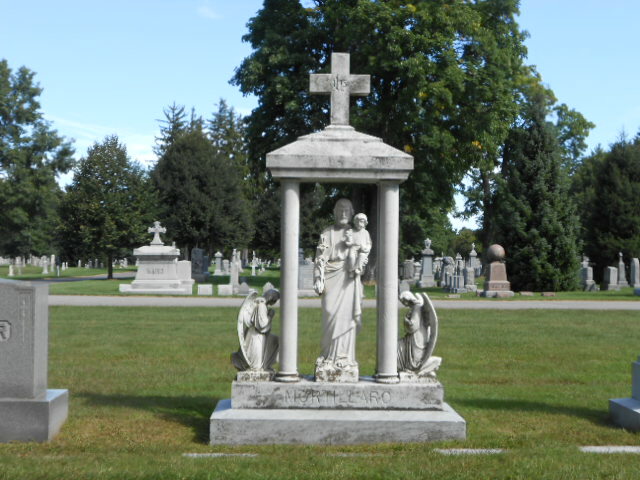 There are some really neat sculptures and mausoleums. I especially like the firefighter’s memorial, since my Dad was one for many years. Yang and I have been to Mt. Auburn, and I agree that it’s wonderful. You also see lots of wild life there, too. 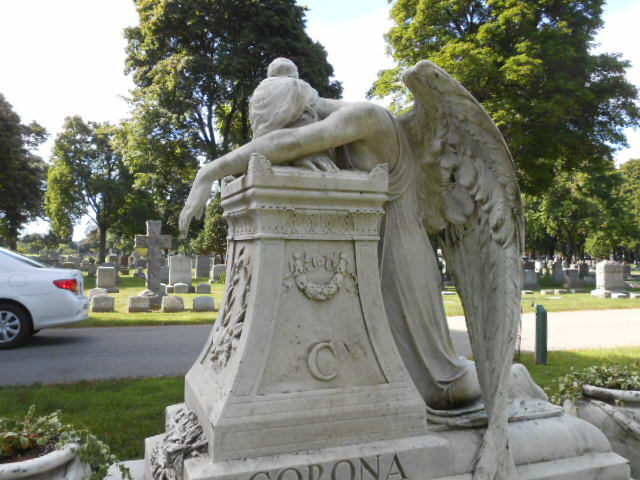 Lowell Cemetery has some really neat monuments and mausoleums. I think I have some pictures. I’ll have to do a blog on that if I can find them. Otherwise, it’s a trip up there to take pictures. I can’t wait for more info on the book, too. I will let you know as soon as I find out anything – and thanks so much for your support. Hi Sharon! I finally got my Blog up and running!!! Been playing around with this for a while and finally have a bit of time to start it! I hope you will check it out 🙂 It is going to be mostly about my cemeteries and abandoned places I go so nothing crazy but stuff I love:-) LOVE your book By the way!!! Well have a wonderful evening and enjoy our fresh snow! They could afford to build these lovely sweeping cemeteries over here because there’s so much land and some many fewer centuries of dead. But it is lovely concept, the holidaying in the cemetery. Although considering the last two episodes of the last season of Dr. Who, thinking about the myriads of dead is a little unsettling at the moment. Brrr, cybermen!